Please see the correct information from George Schmidt. There were two separate legal actions. In 2009, CORE filed an EEOC complaint against CPS, charging that the firings of veteran teachers was racially discriminatory. That complaint is still pending. In 2010, the Chicago Teachers Union (by then led by CORE people) filed a federal lawsuit charging that the June – August 2010 firings of veteran teachers in Chicago was unconstitutional. That’s the lawsuit that was won last week. (Substance published the decision along with an analysis by John Kugler at www.substancenews.net). Chicago Teachers Union v. Board of Education was a federal civil rights case. And it had nothing to do with the race of the teachers who were fired. It was based on the Fourteenth Amendment (equal protection) and decided, as you can read in the decision, on that basis. I don’t think there was one reference to race in Judge Coar’s decision. “Four hundred thousands students will have their teachers returned to them,” an elated Karen Lewis told a press conference at the headquarters of the 30,000-member Chicago Teachers Union on the evening of October 4, 2010. Lewis’s statement was her opening in describing the immediate impact she thought should take place in light of a federal judge’s decision that the Chicago Board of Education had violated the rights of tenured teachers in firing them during the summer of 2010, using inflated “deficit” claims as the basis for creating a financial emergency and assuming to itself unprecedented powers. 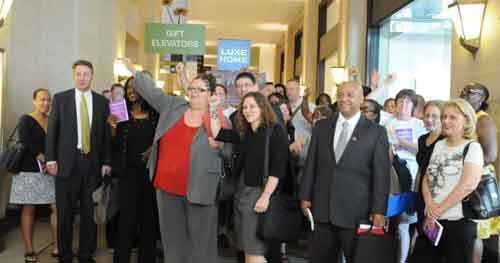 Chicago Teachers Union President Karen Lewis (with hand outstretched) was surrounded by members of the expanded union negotiating team on July 23, 2010, when she led union members and the union’s newly elected officers across the street from the union’s Merchandise Mart offices to the Holiday Inn Mart Plaza for the first meeting with Board of Education negotiators. The Board demanded $100 million in cuts from the CTU contract, even thought the Board’s claims of a billion dollar deficit had been discredited, and when the union refused to buckle, Ron Huberman order the elimination of more than 1,000 tenured teachers from their jobs. Substance photo by George N. Schmidt.For the second time in six months, a federal judge has handed a rebuke to the Chicago Board of Education because of the Board’s lawless (and unconstitutional) actions. On October 4, 2010, U.S. District Judge David H. Coar in a strongly worded opinion held that CPS had violated the rights of more than 1,000 tenured Chicago teachers when it fired them from their jobs based on a number of spurious grounds that had been conjured up by the Board during the summer of 2004. In the October decision, Judge Coar held that the Board of Education of the City of Chicago and its Chief Executive Officer, Ron Huberman, had violated the rights of tenured teachers it has been firing since June 1, 2010, under the guise of various pretexts. Despite the clear language of the judge’s decision upholding tenure, Patrick Rocks, the top lawyer for CPS, claimed in a quotation distributed by CPS in an October 4 press release that the judge’s ruling only allowed the teachers CPS had dumped to “complete for jobs.” At a 7:00 p.m. press conference held at CTU headquarters, CTU President Karen Lewis told reporters that the judge clearly disagreed with Rocks’s version of the law. “We won,” she said, chiding reporters from WBEZ and Catalyst who kept repeating the Rocks talking point after she had explained the decision.